I am one of those elusive kids who find time to speak to their parents while going from one place to another in a cab. Or when they have some work to get done by them. And each time the conversations last forever and the next few minutes post the phone call, immense guilt pangs hit heart over inadequacies of communication in many other days. I randomly picked up my phone and dialed his number. The fact that there was a fifteen minutes old message in my phone which read ‘very busy it seems‘ had some effect, one cannot tell. But the thirty minute impending cab ride was surely a motivator, we can say. And one hour later we had exchanged all our views from Smriti Irani to JNU to obviously Jat protests. At the end of it he simply said, ‘life kaisi hai par’, and we both laughed. Because this is how many of our conversations pan out. I recently came across an article on my Facebook timeline : Why do we teach girls that it’s cute to be scared? Instantly I thought of him. He would have thrown his hands up in the air and sighed. Bringing up two daughters in a 90s world was a task. Cute and scared. Both of these were off the table in our house. I often come across blogs, websites journals and videos on good parenting. And it is very heartwarming to see that many express the need for parents to let go. Allow children to explore their own ideas and ways. My parents were probably the ones who ghost wrote these lectures back in 90s. We had no curfews. We had no ideologies to stick to. We didn’t even have religion as a yard stick to teach good ways. We simply had one brief to live by. If it seems right to you, go ahead. That was a lot to take in one childhood. And hence we had to back it up. By being aware, reading, knowing whatever there was to know to grow. Evolve. Understand. And of course we had them at dinner table throwing funny questions at us. There was no escaping with silence. Our family didn’t have canes to discipline us, they had those steely gazes. Even today if we meet once a year and there is a discussion (which is always so!) around politics and one of us doesn’t know the correct facts (which is necessarily my sister), there is a ‘youth of this country will drown us’ discussion. I was always extremely close to both of my parents. There isn’t a day that goes by that I don’t miss them. Enjoy your parents and appreciate them while you have them. Life is too short and time moves to swiftly. This post reminds me of a short chat we had one day in one of the comment section of either your or my blog regarding our dads..I think it was in 2014 or 2013, I don’t remember the year exactly but I do remember how we both agreed that our dads made us who we are and cute and scared certainly weren’t a part of that…Loved the post but I don’t need to tell you that, do I? Wonderful stuff, Richa. And to think he raised two girls without your Mom through the most difficult years is truly a testament of a fantastic Dad. Fabulous. Stay Blessed Richard always!! 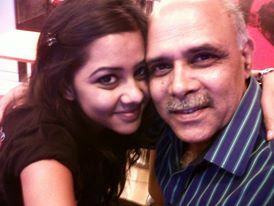 Yahh.. Dad’s love wow.. your memories defines the bond between dad and his princess..! !Amazing isn’t it!! That’s a lovely post :). I really like the point about parents letting their children let go. It’s like many a time parents hold on ensuring that their children do this or do that. While that is important to an extent, it’s also always necessary to ensure that they learn from their surroundings, peers etc. as well and can discuss freely with parents on what they learnt or unlearnt. Being overbearing maybe ok for sometime but it’s also important to be a friend and understand your children’s thoughts and emotions. Placing faith in your own upbringing is prime.